I love Terry Pratchett's books. And I love Neil Gaiman's books. 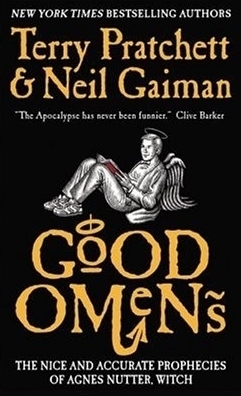 So naturally I was really excited about reading Good Omens, a collaboration between these two fantastic authors. It was so good and I really hope that they consider writing another book together at some point as their individual writing styles really compliment each other. The humour of Pratchett's writing was present as were the footnotes that can be found in his Discworld series. This combined with Gaiman's penchant for creating dark and disturbing tales made this story utter perfection in my eyes. In this story, a direct descendent of Agnes Nutter, a Witch and prophet, is in possession of a book which contains all her prophecies which are very accurate indeed. The prophecies (and therefore the book) ends on a Saturday with Armageddon. The end of the world is coming about because the Antichrist has been placed on Earth, a young boy placed in the care of a normal human family, and representatives from Heaven and Hell are placed on Earth to ensure that the Divine Plan is kept on track. Lot's of mishaps and confusion results and everyone (on both sides) is left scrambling around trying to avert the destruction of life as we know it. I loved all the individual characters and there was quite a cast (luckily at the front of the book there was a list of characters for reference although I only used it at the beginning of the book) and I thought they were all really well developed. I really liked Crowley and Aziriphale and I enjoyed how they interacted with each other. All in all, a fantastically, humorous time was had by me while reading this book!